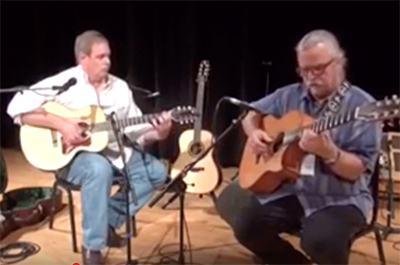 Tim Sparks & Tom Lieberman are the guitar-playing two-thirds of Rio Nido, a vocal jazz trio founded in the 1970s with chanteuse Prudence Johnson. Much of Rio Nido’s appeal is the guitar interplay of Sparks and Lieberman. Each is an established artist in his own right, and together, their chemistry creates music that is entirely unique, idiosyncratic and beautiful. Hear them play at Crossings on Sat., Apr. 6, at 7:30. Tickets are $22 in advance and $25 at the door.